For some strange reason (even though there are a few parallels), after watching The Gradual Demise of Phillipa Finch, I felt like I was watching Harvie Krumpet for girls. 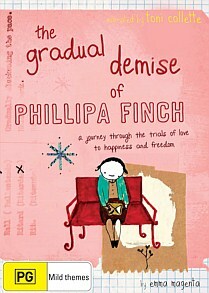 This is not to say that The Gradual Demise of Phillipa Finch is a bad film, rather it's a very surreal and emotional roller coaster ride for its character Phillipa Finch, who definitely has more things going on in her life, besides collecting strange objects that may be attributed to some mental health glitch. The story is also beautifully narrated by Australia's very own Toni Collette who does add a unique quirkiness to the story... not that this story is not quirky enough! Never having read the book, Phillipa Finch is based on the wonderful creation of writer/artist Emma Magenta about an emotionally dead young woman. After a string of painful relationships and a dead-end and soulless existence, Phillipa soon realises that the path she has chosen in life has been quite detrimental towards really living. This may also be the reason why her obsessive compulsive nature has required her to collect strange and unconventional items such as cups, hair and even a fox to name a few of the strange and obscure items... did I also mention strange visitations to parallel universes and emotionally scarred realities. Nonetheless the key to Phillipa Finch is that all these items and strange people or beings that she meets have an underlining meaning to them or metaphors to her scarred existence and in order to fulfil her superfluous yet metaphysical therapy, she must rediscover herself. Even after watching this story, I'm still confused about certain elements about Phillipa's journey but like the outstanding short-film Harvie Krumpet, The Gradual Demise of Phillipa Finch is a beautiful yet emotional journey about a woman who rediscovers the world again and herself. With some amazing animation, decent video and audio quality, this film is truly a mind f@$K!